NOTE: So far, I think this is the only source reporting this story. Normally I would not report something so thinly sourced here, but this is important enough to discuss. We all know that Senator McCain’s seat will be relinquished soon one way or another, and the possibility that he will resign now is being discussed generally. Senator John McCain will resign his US Senate seat on July 4, 2018, says an aide who asked not to be named because he was not authorized to speak to the press. “In the end, it was about Kennedy resigning from the Supreme Court,” said the aide. “Confirming a (SCOTUS) replacement before the election is considered in the interest of the national Republican party, so that it doesn’t become an issue for Dems to run on in every race,” said the aide, meaning every race for Senate or Congress. The Aide indicated that the Senator wanted to wait until June 1 to resign, so that his seat would not be on the ballot along with retiring Jeff Flake. Republican Gov. Doug Ducey will appoint a Senator to serve until the 2020 election. The aide said that Ducey has quietly offered McCain’s seat to Cindy, but the 64 year old wife of Senator John McCain has made no decision as of yet. “Understandably, she doesn’t want to think about it,” he added. I think it will be his wife. Better than having a Democrat taking the seat in an election. As it looks now, it will be an appointment by the governor of Arizona. I’m not sure if that lasts just until this November, or until his term expires in 2022. I am concerned about how he can torpeodo the Presdent’s judge choice. I think the intent is to support the President’s choice. I guess I just don’t have enough respect for him to think he might do the right thing…………even after his death. McCain voted for Gorsuch. None of the Republicans voted against him, and I don’t think they will this time either. We could use McCain’s vote. I sure hope you are right, but I lean toward aus’s view. With no facts, just bitter resentment for what this backbiting, double dealing man has done in the past. For some reason, I am afraid that his hatred of President Trump is so bitter he will use his own death to strike at him. I do not believe he has one iota of patriotism. Why would he? Hes a documented traitor. Q posted directly involving mccain and the SCOTUS confirmation before this announcement came. There is behind the scenes movement here. It is disgusting that he has not resigned due to illness already. What an egotistical jerk. With U.S. Sen. John McCain facing a diagnosis of malignant brain cancer, what happens to Arizona’s seat in the U.S. Senate if he steps down, or dies in office? While the U.S. Constitution mandates that vacancies in the House of Representatives be filled by elections, it leaves to each state how to fill empty seats in the Senate. In Arizona, the governor appoints an interim senator in the case of a vacancy. That senator serves through the next scheduled statewide general election, with the winning candidate in that vote serving the remainder of the original term in office, unless the original term was set to expire at that election. The interim appointee must be of the same party as the vacating senator. In McCain’s case, if he were to resign this year, Gov. Doug Ducey would appoint a Republican to take the seat through November 2018. There would be an election held in November 2018 to determine who would hold the seat through the end of 2022, when the seat would return to its regular six-year cycle of terms. If McCain’s seat became vacant after the 2018 election cycle, the interim appointee would serve through 2020, or the end of the term, depending on the timing of the appointment. What about the “wait until after June 1 to resign” – what significance does that have? ADD2: According to the Santa Monica Observer, it means that the appointee will serve until 2020. Thx. That answers a lot of questions. It is widely speculated that his wife, Cindy, will take his seat. 2. Joan Larsen</b, 49, of the U.S. Court of Appeals (6th Circuit). Having graduated first in her class at the Northwestern University School of Law, Larsen moved on to a lightning legal career: Deputy assistant attorney general under George W. Bush, justice of the Michigan Supreme Court from 2015 to 2017, and then U.S. appellate judge for the past two years. A member of the Federalist Society, Larsen is also a former law clerk for the late Justice Scalia. Pending interviews and background dirt digging I understand that Amy Coney Barrett has the edge. First scenario which accounts for Cindy McCain’s brain overriding her hate. She will be a freshman senator looking to cut her teeth and prove her mettle and usefulness to her party. She is worth $200 million dollars, she has to like the direction the economy is taking under President Trump and is more likely to be an ally than her despicable husband. Also she is going to be gifted the seat, imagine an anointed freshman female senator voting against a well qualified female SCOTUS nominee. She would not find favor within her own party. And unlike President Trump she would not have the power or skills to fight them. People who voted for candidate Trump mostly based on the SCOTUS nominations being kept out of Clinton’s hands would be livid. Normal thinking people would be livid. Cindy McCain is a lock for the presidents nominee. Second scenario. Cindy McCain is just as despicable as her husband. (Cindy did have an affair with the husband of a woman with cancer and married that man the same year he dumped his wife, so meh, good chance she is an assh*le). 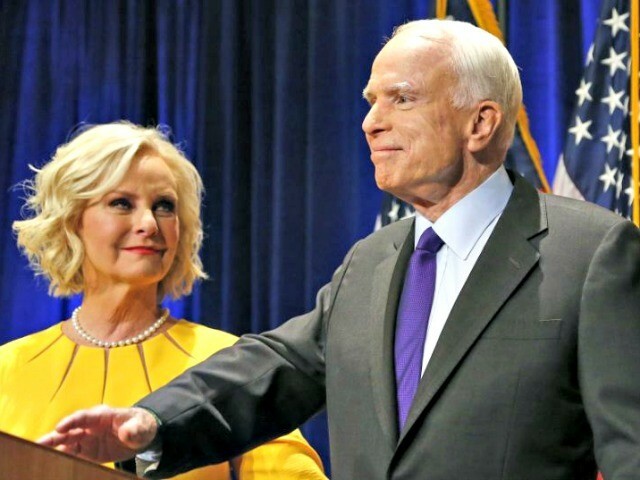 Cindy McCain following in the footsteps of her despicable husband in the Obama Care repeal simply says nope and turns her thumb down on any POTUS nominee. Cindy McCain becomes the MSM darling for standing up to POTUS, she becomes Times’s Person of the Year. Does Mrs. McCain hate President Trump more than she loves her country. Probably. She is married to John McCain. Does she hate President Trump enough to be willing to risk her fortune. Probably not. I lean toward your second scenario, not sure she would see it as risking her fortune. Soros (okay, I know he has to be way smarter than her in his absolute evil way) sure has made his fortune by breaking others. Bottom line for me is that I believe people whose overriding motivation and characteristic is envy, jealousy, and resentment of those people who show the courage and backbone they do not (yes, this is classic John McCain IMO) will always attack those they feel inferior to (President Trump in a big way for McCain and pretty much every one in Congress, all the media, liberals everywhere, especially academia. No matter how far out of the caves we get, most men (and now lots of women) are still going to line up outside the cave at the latrine and compare size. Metaphorically. I said this a long time ago, during the election, and SD used it in a post. President Trump is a lion. Lesser predators will always want to gang up and take the lion out. I agree with this, but never forget that President Trump has been filling his quiver for decades, candidate Trump said he didn’t consider McCain a hero and he survived that “impudent” remark. In fact the brouhaha died down pretty quickly after the MSM decried it as the final nail in Trump’s coffin. McCain is dying, perhaps that is why he felt safe in putting the kibosh on Obama Care repeal. Cindy likely has a relatively long time to live let’s hope that President Trump has the means to make that life a living hell if she betrays her country like her vile husband did. It would be a travesty for Cindy McCain to be appointed that seat. No time for royalty or nepotism. Put a solid conservative there for Pete’s sake! No pro-abortion person should be given a seat in the United States Senate. Cindy McCain is definitely not pro-life. Whoever is placed in the role of senator from Arizona should be on the job from the get-go. Since obviously there’s no way to know when John will die, she should not be away from the same domicile as her husband. Being several thousand miles away when he dies would be reprehensible. I’ve always been against giving any vacated elected seat to a surviving spouse or any family member. That U. S. Senate seat is not a McCain family seat. I’m totally against Cindy McCain being in WDC for four years. The governor is not thinking of the good of the country but of giving John McCain a gift on his death bed. Adding to the swamp is bad for the nation. Better decades late than never. The daughter of John and Cindy McCain gives us a window into the heart of the McCain family plans for the future. Meghan McCain said Friday she’ll “never forgive” or move on from how President Donald Trump and his administration have treated her father, Sen. John McCain. I will not be commenting on the obituary thread for McCain when he finally passes. I can certainly understand Meghan loving her father, that is if the stuff about him beating the carp out of her mother isn’t true. But, I think I will just keep silent because……….well, because I should. I’m old enough to remember when McCain pretended to run for president, after being the most-liked Republican (the only-liked Republican, actually, besides Mitt Romney, who also pretended to run for president) by the MSM, then being turned into the Devil Himself by the MSM when he ran, and then being, again, the most-liked Republican a year later. Good times. We need to bring back Lincoln/Douglas-style debates. I’m glad that Trump knew how the American Idol-style MSM-driven debates worked, via long experience. But we need to bring back the concept of telling the MSM to all STHeckU during debates, entirely. MSM needs to not even be present at all. None of them. Let CSPAN handle it? No. Heck, let one webcam handle it, with no operator. Trump would have won a Lincoln/Douglas-style debate too. He would have won the popular vote, too, if those were the rules of the game. He said so himself. But no, Electoral College is the rules of the game, currently, and for a long time, and he played THAT game.